Brookings is home to several beautiful beaches. Take an afternoon to explore them, picnic or walk the adjacent trails. Some of these beaches boast a treasure trove of shells and stones, while others provide a glimpse into marine life through tide pools. Camping accommodations can also be found. Harris Beach State Park, on the north side of Brookings, has an exceptional rocky coastline dotted by monolithic sea stacks and bordered by gorgeous spruce, fir and pine trees. Sea lions, sea birds and seals are a common sight along the beaches, and in winter and spring you may see migrating gray whales. Bird Island, just offshore, is the largest island off the Oregon Coast and is a National Wildlife Sanctuary and breeding site for rare birds, including the tufted puffin. The park offers RV hookups, showers, restrooms, tent sites, Wi-Fi access, playgrounds, and cabins, yurts and teepees. Interpretive events, tours and educational programs are all available. 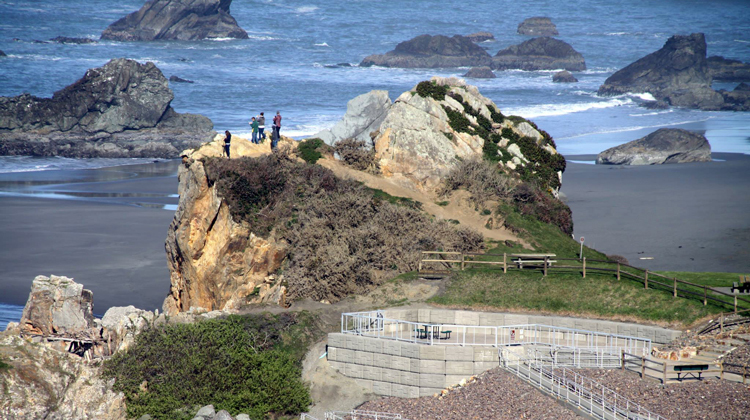 Chetco Point Park is a nine-acre beach park located half a mile west of Brookings, off Wharf St. The park features a large play area with lush rye grass, picnic tables and horseshoe pits. If you follow the walking trail south, both Chetco and Mill Beaches at the end of the trail contain a rich supply of shells, stones, marine life and ever-changing views of the power of the sea.